One of the lesser-known joys of my work is the chance to take pictures of the gadgets I review. It gives me a chance to exercise whatever photographic talents I may possess, and it frees my editors from running the same PR-provided shots or stock images that every other site can get. But it’s taken me a while to acquire some basic competence at this weird art form. The most difficult part of the exercise–still–is keeping dust and reflections out of a shot. In the sort of close-up photos often required for gadget photography, grains of dust can look as big as cookie crumbs–except when you’re looking at the viewfinder or screen of a camera while taking the shot. Likewise, the glossy screens on almost every portable gadget are frighteningly efficient at reflecting overhead lights, nearby windows, any decor on the walls, and the camera itself. I deal with dust by taking a microfiber cloth, the kind you get for free with a new pair of glasses, to the device I want to photograph–even if it looks pristine. Then I repeat the exercise. As for reflections, you can avoid some of them by angling the device’s screen in just the right direction. But it’s easier to prop up a large sheet of posterboard in a position where its expanse of white will be reflected on the screen. In rare cases, you can use a reflection for artistic purposes. Posterboard also makes for a decent backdrop, but it doesn’t exactly add any excitement to the composition. Instead, sometimes I’ll hold a phone in front of an expanse of wall or window and let the shallow depth of field provided by a macro focus blur out that scenery. Not often enough, I will think of a background that’s both more interesting and actually relevant to the subject–like when I parked an Apple TV and a Roku receiver on top of a page of TV listings. Putting a digital device next to a comparable analog object can yield interesting results too. Or I can shoot so tightly that you can’t see anything else but a detail on the back or the screen of a device. The trick is to ensure that only the relevant plastic or pixels is left in focus to command a viewer’s attention; it would help if more cameras included the tap-to-focus feature offered by some smartphones. You don’t need much of a camera for this sort of photography. Anything with a decent macro-focus mode and optical image stabilization (to compensate for the longer exposure times needed for indoor shots) should work. That allows for most point-and-shoot cameras–I’ve taken most of the shots linked to here with the cheap Canon I bought in 2007–but I’ve gotten decent results with some phones and tablets too. Whatever the model, don’t even think of using the flash. You will quadruple your dust and reflection problems and make the device look too pale. You want to avoid that kind of sloppy result whether you’re trying to provide an accurate illustration in a gadget review or you just want a non-ugly photo for eBay–which is where I started picking up on some of these lessons. If you have other tips or suggestions, I’ll take them in the comments. This entry was posted in Gadgets, How-to, Photos and tagged ebay, gadgets, how to, photography by robpegoraro. Bookmark the permalink. Rob, your camera description is pretty useless…”a cheap Canon”. It doesn’t tell us what you’re using. I’d recommend a DSLR and a macro lens or at least a lens capable of close up photography. 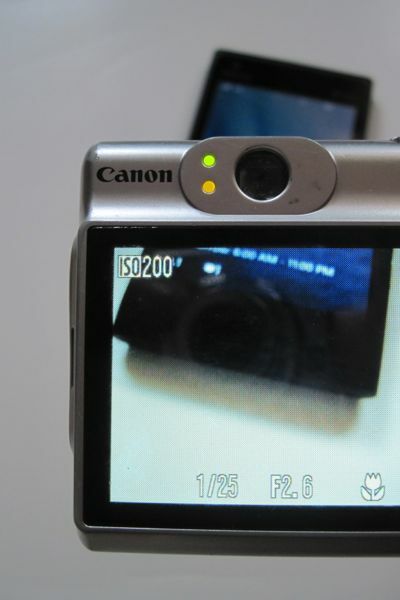 With the DSLR you can actually see what you’re taking a photo off. You might consider some good photo editing software, such as Adobe’s LightRoom or even Elements ,which will allow you to get rid of the “dust balls”. Lightroom would certainly offer me more tools than iPhoto, but it would also eat up a lot more time–it’s quicker to swab a gadget’s screen a couple of times with a microfiber cloth.